Learn to write blog posts, emails and webpages that get the word out on the mobile web at Reach Readers Online, our three-day online writing workshop in Portland, Oregon, on July 24-26. 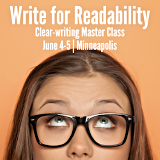 Make mine to go Learn to write emails, blog posts and webpages that overcome the obstacles of reading on the screen in our online-writing Master Class in Portland, Oregon, on July 24-26. Save $100 when you book by May 24.
by May 24 to receive a full refund, minus a 20% handling fee. by June 24 to receive a 75% refund. Sorry, no refunds after June 24.